Partner to Succeed, Cornwall’s business collaboration network funded by ERDF Convergence, gave examples as diverse as Nike teaming with Apple to produce an ipod sensor for trainers; or Ford working alongside Fiat to develop a replacement Ford Ka and Fiat 500. Partner to Succeed also gave some examples of collaborations it has facilitated through the programme since its launch last June. Mark Sansby, business development manager for Partner to Succeed, reflected on one particular collaboration which is showing early signs of success with interest from a number of public sector bodies. A dozen quality Cornish brands have also collaborated to expand their businesses by developing an event in central London later this month to meet journalists from a number of high quality magazines and newspapers, as well as relevant distributors and buyers. 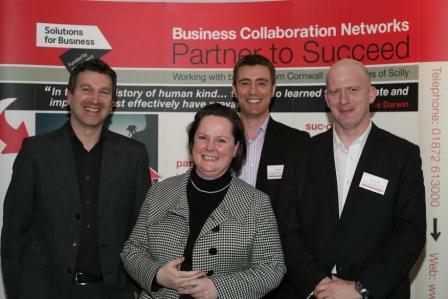 Partner to Succeed is running the event again this evening (March 4). If you would like to attend, please contact Lucy Cox.